How do you get a self-centered, tactless nerd out of your life, even though he saved it? What a surprise when Rick (Terry Jones) shows up unexpectedly at Willium’s 34th birthday party, also attended by Warnock Waldgrave (Monty Bieber) an overbearing business associate; his mousy wife, Clelia (Linda Granger); and their son, Thor (Jace McCloy), the nightmare child. Willum’s delight soon fades as it becomes clear that Rick is a hopeless “nerd”. . . self-centered, boring, a bumbling child-man with no social skills, little intelligence, and zero tact. However, Willum’s gratitude (and his guests) put up with Rick’s irritating behavior, stupid games, rambling and inane conversation - everything that makes him the guest from Hell. And Rick stays on and on, creating one chaotic situation after another leading the normally cool and calm Willum to contemplating violence. This unparalleled evening of entertainment ends with a “twist” so be prepared! He's socially awkward. He's wearing suspenders, a pocket protector and glasses so thick they're practically opaque. He's "The Nerd" and he's staying for dinner and possibly even lingering around after that. In "The Nerd," Rick Stedman over stays his welcome while visiting the home of the man he saved in Vietnam. 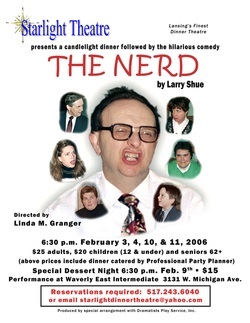 "The Nerd," Starlight Dinner Theatre's first production, takes place where geeks quiver at the prospect of bullies taking their lunch money — the cafeteria. Linda Granger was the principle planner in creating Starlight at Waverly East Intermediate School, 3131 W. Michigan Ave. — a new venue on Lansing's west side. Granger transformed the school's cafeteria to create Starlight Theatre. Twinkling lights, lanterns centered on linen-lined tablecloths and delicate china and silverware create a fantastic guise — making a nerd look like a stud. "I've always wanted to do a dinner theater because there's not one in this town. It's going to be much more relaxed because we're going to have tables of six. You know, you sit with your friends or you meet new people and get to be very comfortable while you're watching the show," she said. The nexus between the Waverly community and theater are at the crux of Granger's project. "I went to school there and thought, you know, I'd really like to support this area," she said. Granger wanted to bring culture to the west of Lansing so she found community actors, and she plans to use a local caterer. She thought that she would wait until retirement to manage a theater until she read the book "Finding Your Own North Star: Claiming the life you were meant to live" by Martha Beck, and was encouraged to make her dream happen. "I can get involved in any creative aspect of it that I want to," she said. 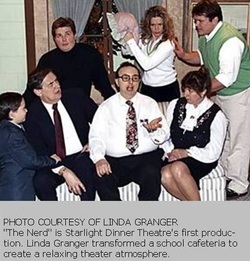 For Granger, "The Nerd" was a natural choice for the first play at Starlight. "I've been in it before (about) 15 years ago and it's absolutely hilarious. Some people absolutely love it and will come back even if they've seen it before," she said. Granger has graced local stages since she was 19 years old. She has performed in 42 theatrical productions with companies such as Riverwalk Theatre, Lansing Civic Players and Lansing Community College, and she has also won numerous awards for directing plays for the Lansing Civic Players. "The knowledge I learned from that experience has really helped me and I just learned so much so I know what it takes to get an audience in. I know how to do the public relations and the publicity," she said. "The Nerd" stumbles on stage Feb. 3, 4, 10 and 11 at 6:30 p.m. Tickets are $25 for adults and $20 for children 12 and under and seniors 62 and older. Tickets for a special dessert night scheduled for Feb. 9 are $15. To reserve tickets, call (517) 243-6040. 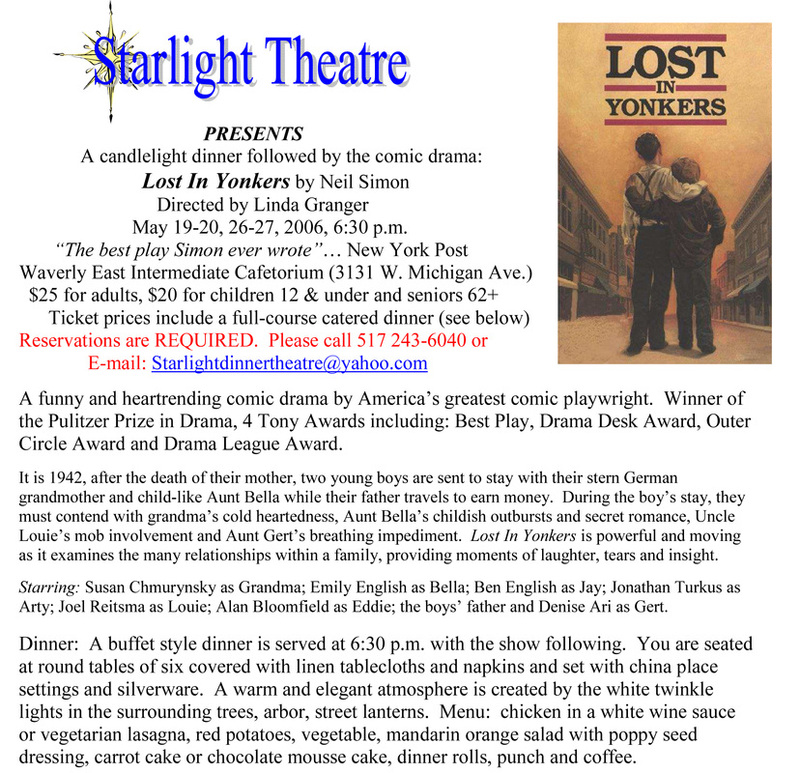 A funny and heartrending comic drama by America’s greatest comic playwright, Neil Simon, takes center stage as Linda Granger’s new Starlight Dinner Theatre presents the comic drama Lost In Yonkers. Performances will be held May 19, 20, 26 & 27, 6:30 p.m. at Waverly East Intermediate Cafetorium (3131 W. Michigan Ave.). Ticket prices are $25 for adults and $20 for children 12 and under and seniors 62 and over. Ticket prices include a full-course dinner catered by Professional Party Planner. Lost in Yonkers: Winner of the Pulitzer Prize in Drama, 4 Tony Awards including: Best Play, Drama Desk Award, Outer Circle Award and Drama League Award. The story: It is New York, 1942, after the death of their mother, two young boys, Jay (Ben English) and Arty (Jonathan Turkus) are sent to stay with their stern, iron-clad, German grandmother (Susan Chmurynsky) and child-like Aunt Bella (Emily English) while their father (Alan Bloomfield) must travel to earn money to pay off a large debt incurred to loan sharks which paid for his wife’s medical bills. 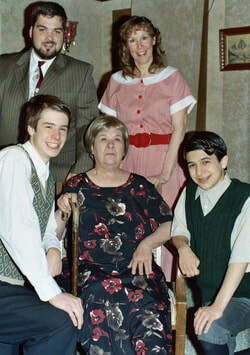 During the boy’s stay, they must contend with grandma’s cold heartedness, Aunt Bella’s childish outbursts and secret romance, Uncle Louie’s (Joel Reitsma) involvement with the mob and Aunt Gert’s (Denise Ari) breathing and speech impediment which occurs only when she visits her mother. Director, Linda Granger, said “Lost In Yonkers is powerful and moving as it examines the many relationships within a family with moments of laughter, tears and insight.” For ticket reservations or to obtain any additional information, please call (517) 243-6040 or e-mail starlightdinnertheatre@yahoo.com.